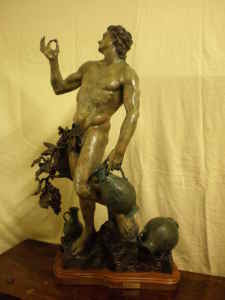 This sculpture is an original limited edition bronze sculpture, signed (base), dated 1999 (base), the full work, in good condition. The sculpture comes with Certificate of Authenticity, Deed of Ownership and a full Appraisal Report. The certificate of authenticity was signed by the artist, Mr. Lorenzo Ghiglieri while the appraisal was conducted by Mr. Edward N. Okil of National Institute of Appraisers. The appraisal report dated January 10, 2000 had an appraised value of Thirty Six Thousand Eight Hundres US Dollars ($36,800.00). An updated appraisal report can be obtained from National Institute of Appraisers. 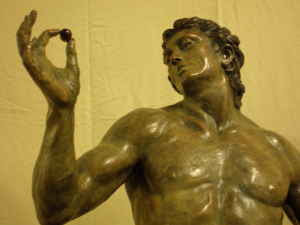 This sculpture has raised the bar on how I want all of my Italian waiters to inspect my olives! It is so refreshing when a man is finally reduced to a set of numbers. And I will say it looks like "the full works, in good condition"
Side note for you MBA types: I went to the National Institute of Appraisers and discovered the best business plan EVER! The higher the appraisal....the more they charge. It is simply brilliant. Link If I was an appraiser everything would be worth a cool million, fo sho!